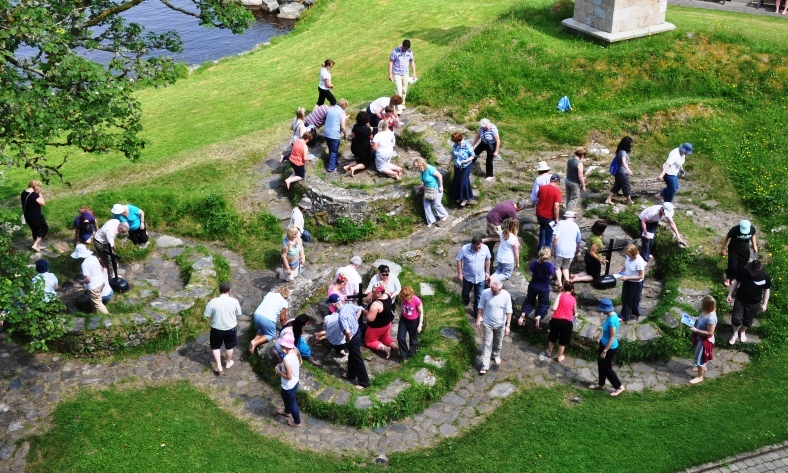 The ‘Beds’ are one of the most prominent features associated with the Lough Derg pilgrimage. 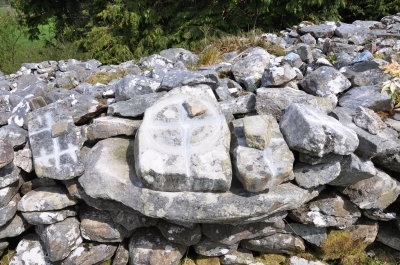 The six Penitential Beds – small low circular walled structures – are the remnants of monastic beehive huts. 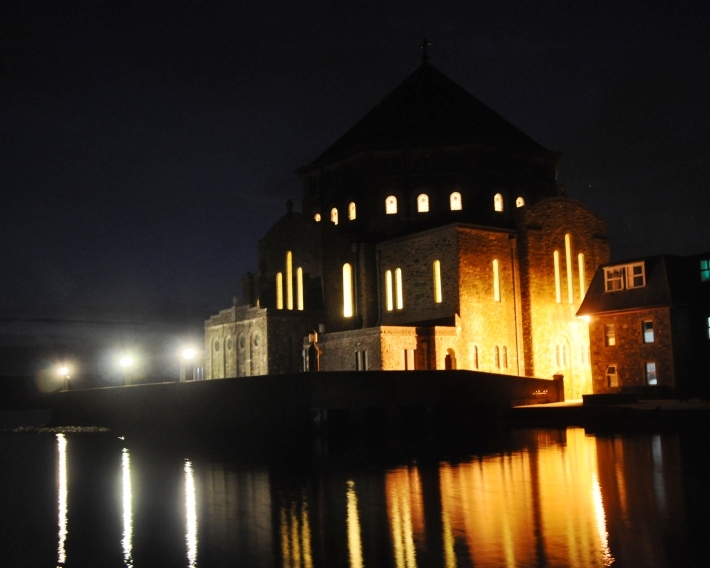 They form a central part of the Stations which pilgrims perform during their stay on the island. This post is a collage of images and texts which centre on the beds. At each of the beds, pilgrims walk barefoot three times around the outside; kneel at the entrance, walk the interior three times and kneel at the cross; during each of these they say three Our Fathers, three Hail Marys and one Creed. This image is a collection of different photos I took over three days in mid-July. By connecting a selection of separate, but related, moments, it is possible to see the beds in a fuller manner. A segment from the morning shows only one or two pilgrims, while the afternoon slices – in the centre – has the beds crowded and silently bustling, and, then, the evening photos present empty beds. They are simultaneously spots of movement and pause, physicality and ethereality, and presence and absence. Every performance of the beds, by each individual, is a new experience. It links the present realities with the prayers and intentions of each person. Also, they are following the paths trod by those who have gone before. Personal and social memories mix with the pilgrimage, as the recent and distant pasts are felt to be present here. The circling and pauses intermix the physical practice and the intentions of the pilgrims so that the beds are both continuity and change. To this visual presentation of the beds, I wish to add a textual component. Three relatively random quotes about the beds, garnished from historical and contemporary sources I am using in my research, show other perspectives on the beds. Alice Curtayne, writing in 1933, described the activity on that beds as being “endless files of pilgrims, walking, kneeling, dipping, murmuring” which made “a scene fantastic beyond all telling” (p.13). I find parallels between her thinking and my own, as when the beds are in use, particularly with a larger crowd, they are alive. The sheer motion of so many people completing a complex set of rituals animate the place and create a unique scene. T.R. Gogarty’s account from twenty years earlier is similarly evocative, albeit a bit more penitential. “Paths, worn and quarried by human feet through rocks that wrench and stones that bend every ambulatory muscle with a pain” (p.809). This highlights the intensely carnal nature of the pilgrimage. A focus on the interactions of the unprotected feet and the rough, yet eroded, rock captures so much of what the beds are for pilgrims. Simon Kennedy’s poem Lough Derg, in a lovely recent collection, Pilgrims’ tales … and more, gives a simple structure to the pilgrims encounter with the beds: “Barefoot pilgrim meander | Over your hobble stones | Of penitential beds. | St Patrick – Pray for us. | St Brigid – Pray for us. | St Columba – Pray for us.” (p.90). The physical activity, the personified island and saintly invocations mingle at this place. Curtayne, A., 1933. 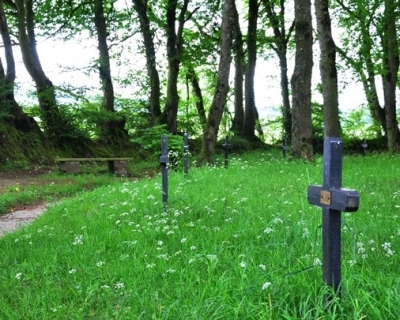 St Patrick’s Purgatory: The sanctuary of Station Island, Lough Derg or An excursion into the fifth century. Anthonian Press, Dublin. Gogarty, T.R., 1913. 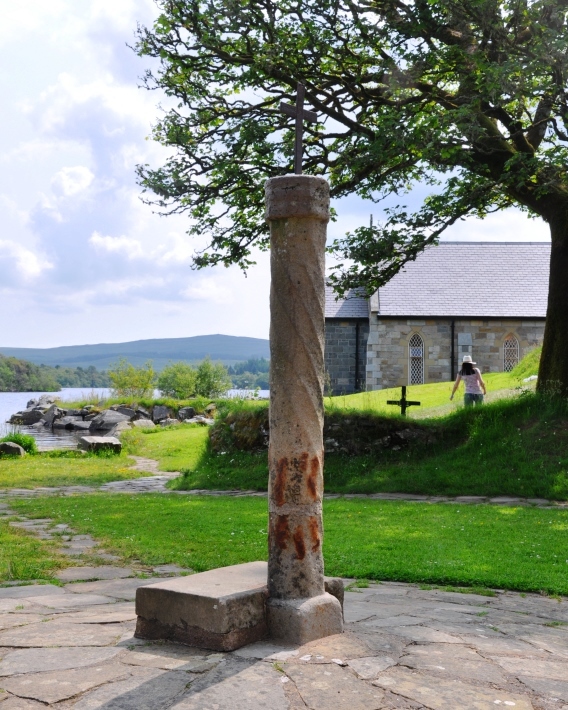 Some pilgrim impressions of Lough Derg, (with several photographs). The Catholic Bulletin, 3, pp.800–813. McDaid, M. and McHugh, P. eds., 2000. Pilgrims’ tales … and more. Blackrock, Co. Dublin: Columba Press. 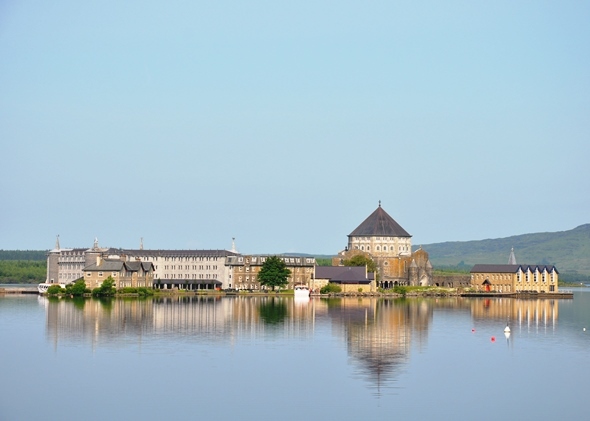 Lough Derg is one of the main sites of pilgrimage in Ireland. Station Island or St Patrick’s Purgatory is a small island on the lake in south-eastern Donegal. It has been a place of pilgrimage and retreat for over 1,000 years. 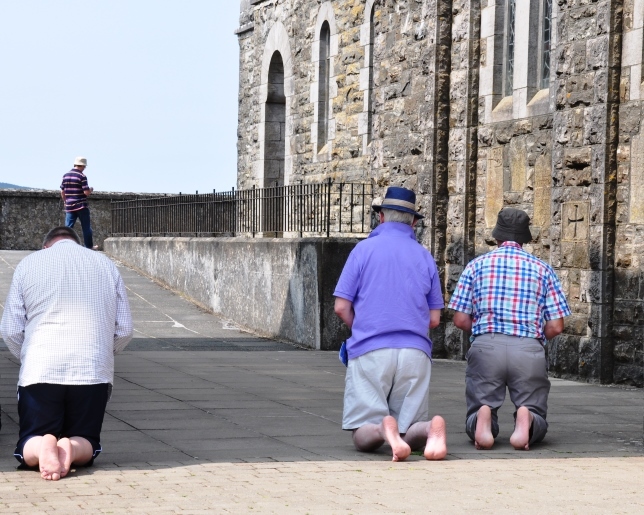 The primary practice associated with the island is the three pilgrimage which sees the pilgrims fasting, keeping Vigil, going barefoot and completing a series of exercises and a set number of ‘stations’. I recently completed the pilgrimage and later returned to the island as a researcher observing and discussing the pilgrimage. To give a sense of what is involved in this pilgrimage, I have put together this account of the pilgrimage station and some of the exercises. It is a synthesis of observations and recordings over a four day period. Pilgrims arrive on the morning/early afternoon of the first day, having fasted since midnight. The journey across to the island is the physical element of the break from the world, this is also facilitated through the non-use of mobiles. A central component of a pilgrimage is a break from the everyday which allows pilgirms to consider deeper more meaningful aspects of their lives. 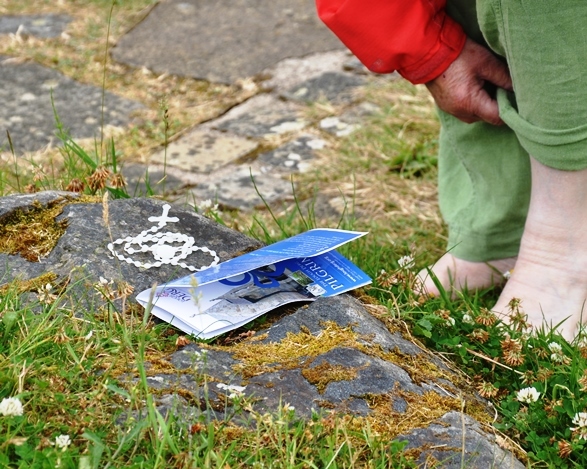 Pilgrims remove their shoes almost immediately on the island. 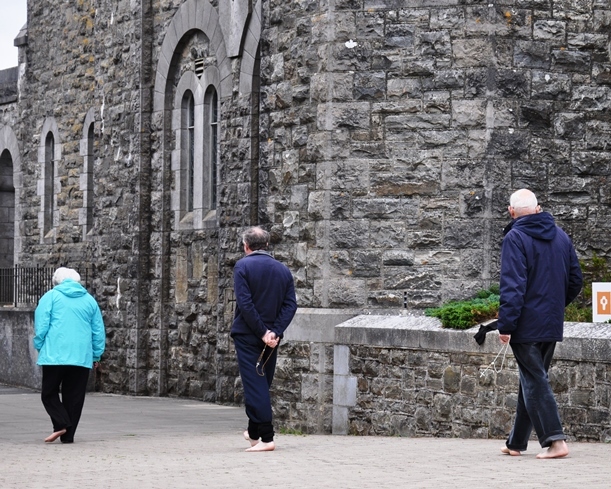 As well as being part of the traditional penitential exercise, the removing footwear creates an equality and shared-experience among the pilgrims. It doesn’t matter what you do outside of Lough Derg, everyone is equal. The Bell, standing on the site of the original cave in which pilgrims spent their Vigil, punctuates daily life, announcing ceremonies in the Basilica and marking the Angelus. Each station begins with a visit to the Blessed Sacrament in tabernacle in St Patrick’s Basilica. Pilgrims go to St Patrick’s Cross, adjacent to the Basilica, kneel down, and say one Our Father, one Hail Mary and one Creed; and finish by kissing the Cross. At Brigid’s Cross, on the outside wall of the Basilica, pilgrims again kneel down and this time say three Our Fathers, three Hail Marys and one Creed. Standing with their back to the Cross and arms outstretched, they say three times “I renounce the World, the Flesh and the Devil”. The Basilica is then rounded four times, clockwise, during which seven decades of the Rosary and one Creed, at the end, are prayed silently. 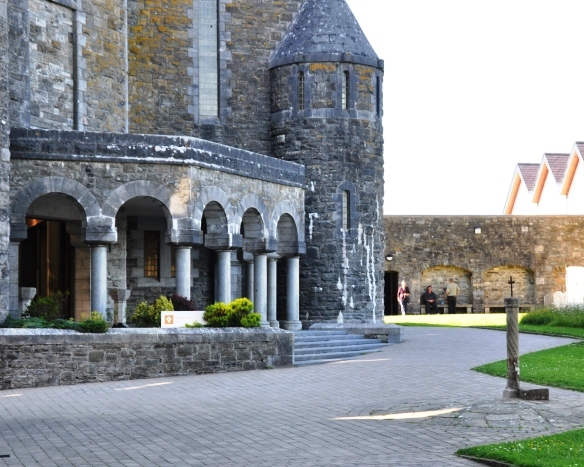 There are six penitential beds – St Brigid’s, St Brendan’s, St Catherine’s, St Columba’s, St Patrick’s and Saints Davog and Molaise’s (the latter two are a double bed). At each bed the pilgrims: walk three times around the outside, clockwise, while saying three Our Fathers, three Hail Marys and one Creed; kneel at the entrance to the bed and repeat the prayers; walk three times around the inside and say the prayers again; and, finally, kneel at the Cross in the centre and say these prayers for the fourth time. There is a slight variation at the last double bed which is circled six times, while saying six Our Fathers, six Hail Marys and one Creed. Large numbers of pilgrims frequently complete the stations together. Here there are number of people circling the outside of St Columba’s Bed, two kneeling and four at the cross in the centre. 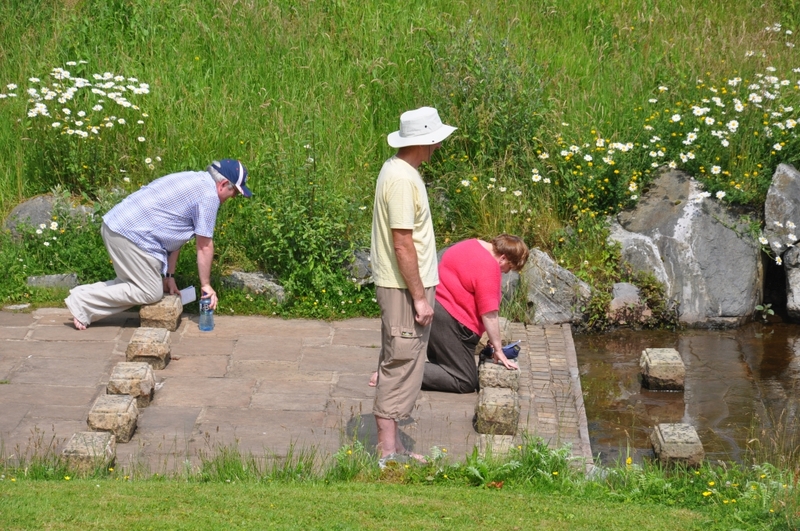 At the water’s edge, pilgrims stand saying five Our Fathers, five Hail Marys and one Creed and then kneel repeating these prayers; after which they, make the Sign of the Cross with the lake water as a reminder of their Baptism. Pilgrims return to St Patrick’s Cross; kneel down and say one Our Father, one Hail Mary and one Creed. They proceed to the Basilica and conclude the station by reciting Psalm 16 (or by saying five Our Fathers, five Hail Marys and One Creed), for the Pope’s intentions. 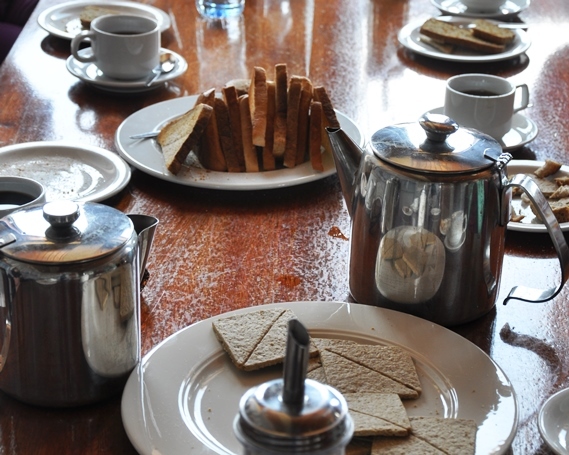 The Lough Derg Meal, which is available at any stage from 1.15-8.15, consists of black tea or coffee (sugar is available) with dry bread, toast and oatcakes. This is eaten once on Day 1 and 2, pilgrims are allowed a similar meal off the island on Day 3. 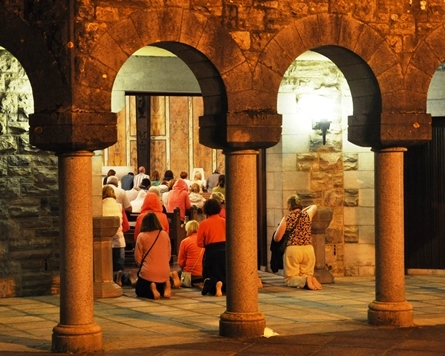 The all-night Vigil is a central part of the Lough Derg pilgrimage, it involves pilgrims staying awake for 24 hours. It begins with the group gathering in the Basilica and the doors being locked. 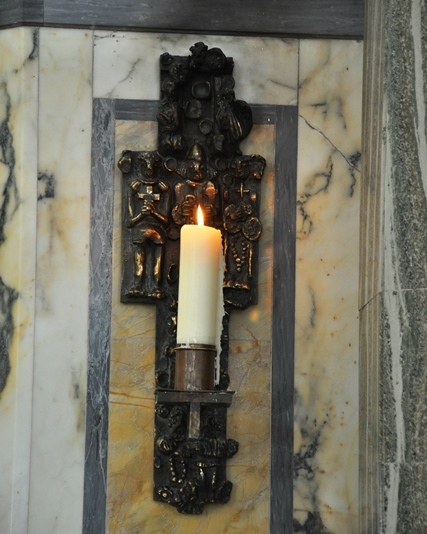 This refers back to a time when pilgrims spent the Vigil in a cave or when they were locked into the ‘Prison Chapel’. While it remains symbolic as the doors are opened later and pilgrims are free to move around the Basilica, it still resonates as a group of people cut themselves off from the world and pray together throughout the night. 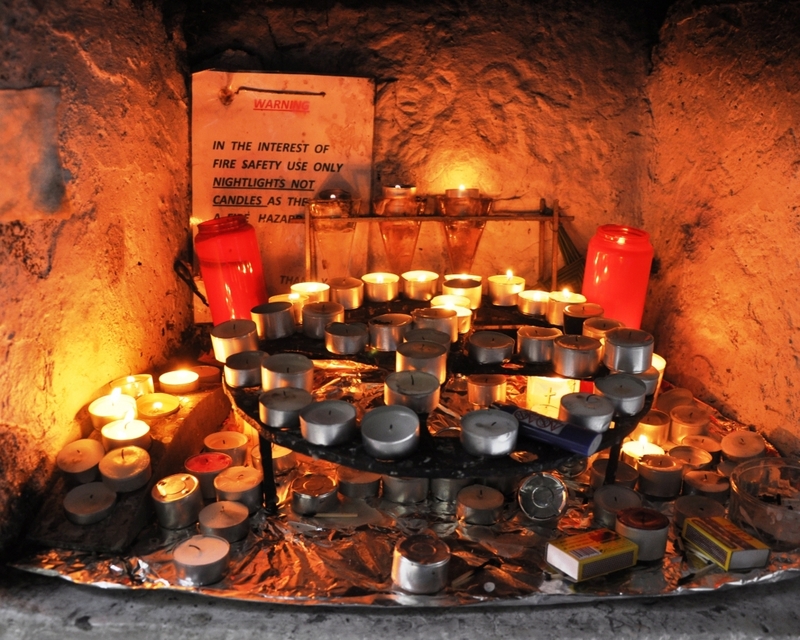 The Vigil Candle remains lighting for the 24-hour period, its lighting marking the beginning of the Vigil and its extinguishing, at Night Prayer, signifies that the pilgrims can go to their beds. The light and sounds of the the vigil pour out from the Basilica on an otherwise silent island. The doing of the station within the Basilica involves pilgrims circulating while following the pattern of movements (rounding, kneeling, standing), as if they were outside. On the morning of Day 3, pilgrims, having completed all the stations, put on their shoes, gather their belongings and leave the island. However, they continue fasting until midnight that night. The fantastic and tranquil feelings this morning is hard to describe, but many are confident they will return. While Lough Derg is firmly one of those places that must be personally experienced to truly understand it, I hope I have in some conveyed even a sense of the place and the practices. 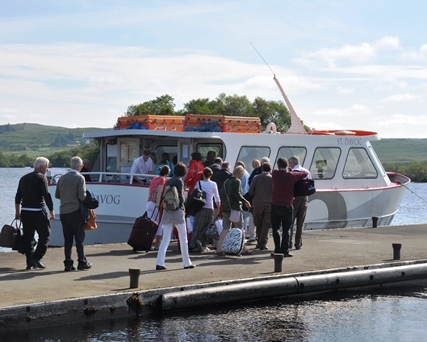 I would urge anyone with an interest or subtle desire, to go on pilgrimage to Lough Derg; it will be worth it. 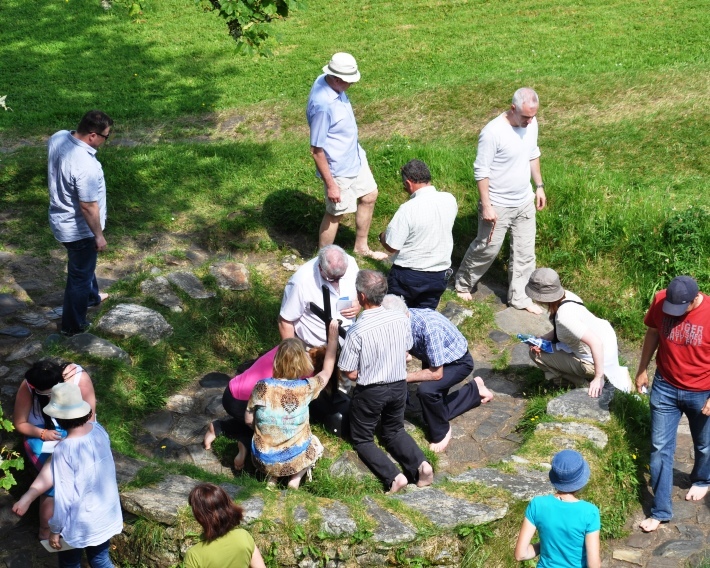 The three day pilgrimage runs from 31st May – 13th August annually (see the website for further details). 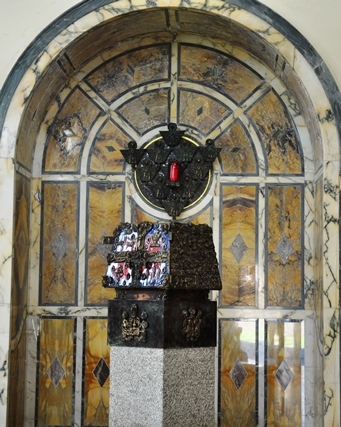 The Stations of the Cross are a feature found at different pilgrimage sites. They are a Christian devotional practice that allows participants to retrace the events surrounding the death of Jesus Christ on Good Friday through prayers at 14 (15 in contemporary Catholicism) ‘stations’. At different holy wells and sites I’ve visited, the actual ‘Stations’ (plaques, crosses, icons) seem to be relatively recent additions. The inclusion of the Stations in these spaces, which in some cases pre-date the popularisation of the practice in the medieval period, may have numerous functions. They can provide a focus for those who are unsure of other devotions associated with a site or for spaces that have no clear traditions; however, it could be suggested that they also represent attempts to bring the performances into more orthodox realms. Regardless, the Stations serve as the basis for individual and communal worship and prayer at these sites. 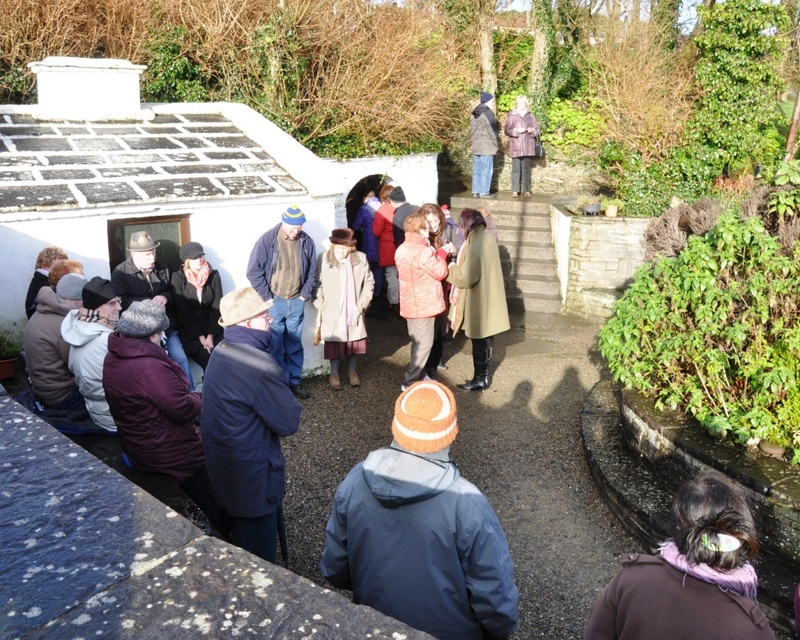 The are an optional devotion for pilgrims/visitors; while also being the main activity in some places, such as feast days at Máméan, Connemara. 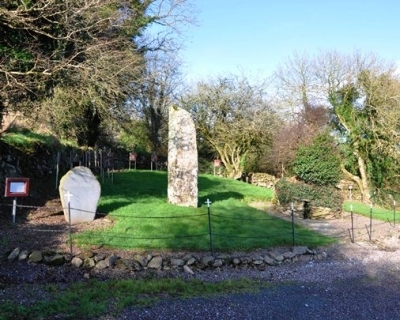 St Olan’s Well, Aghabullogue, Cork: the Stations can be seen in the background circling the side and rear of the site. 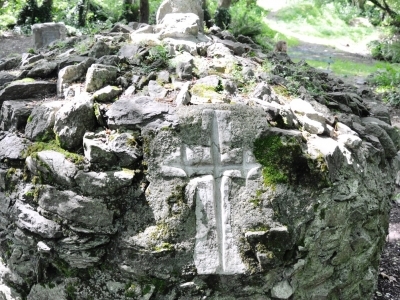 St Fanahan’s Well, Mitchelstown, Cork: the Stations, a series of small crosses, are on the inner side of the oval path behind the well. 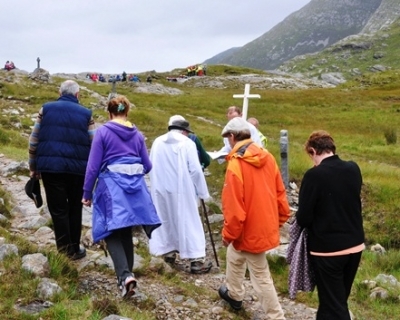 Máméan, Connemara: Pilgrims, led by the cross, complete the Stations on the traditional August pilgrimage day. 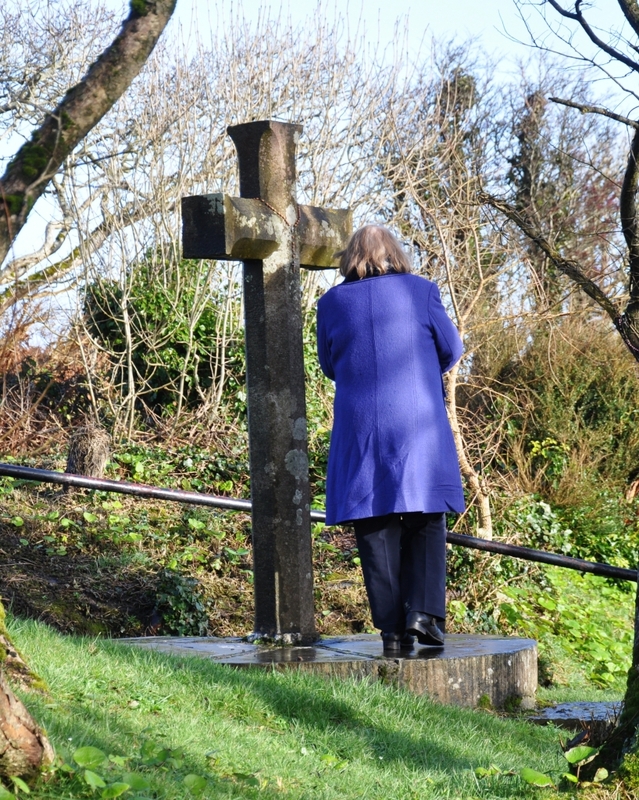 Ireland’s Holy Wells Blog‘s post on St Patrick’s Well, Clonmel offers some thoughts on the Stations of the Cross at that site. 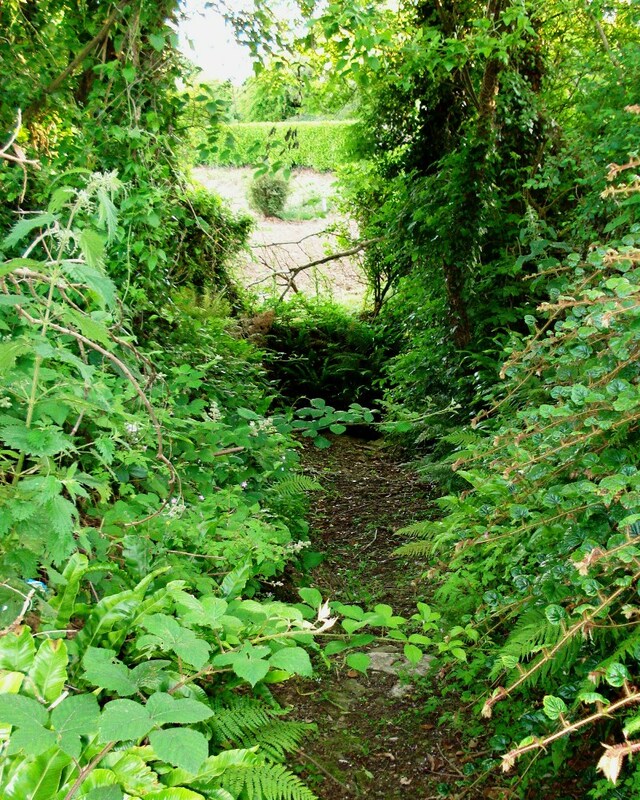 A photo of the short path leading down to the well, which has briars and different plants growing into it. The path is barely noticeable from the road. 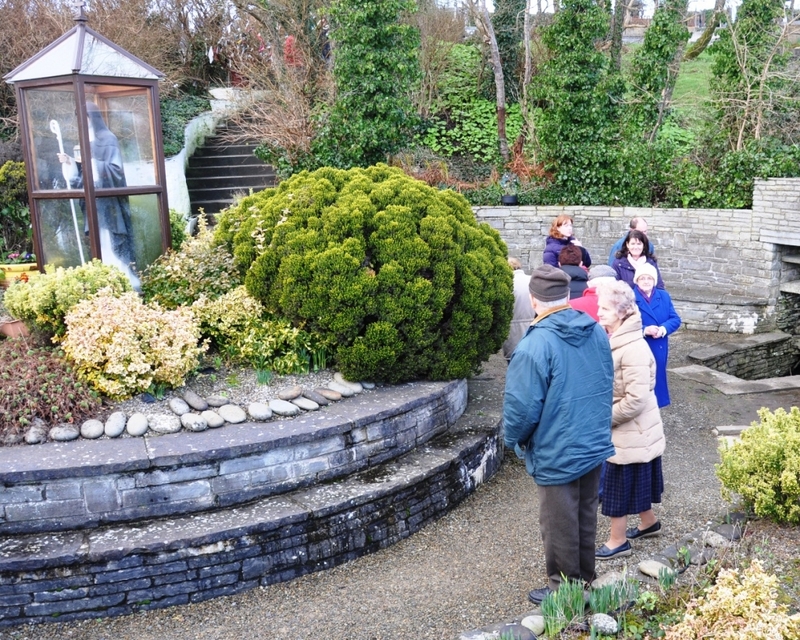 A photo showing the holy well at the end of the path. 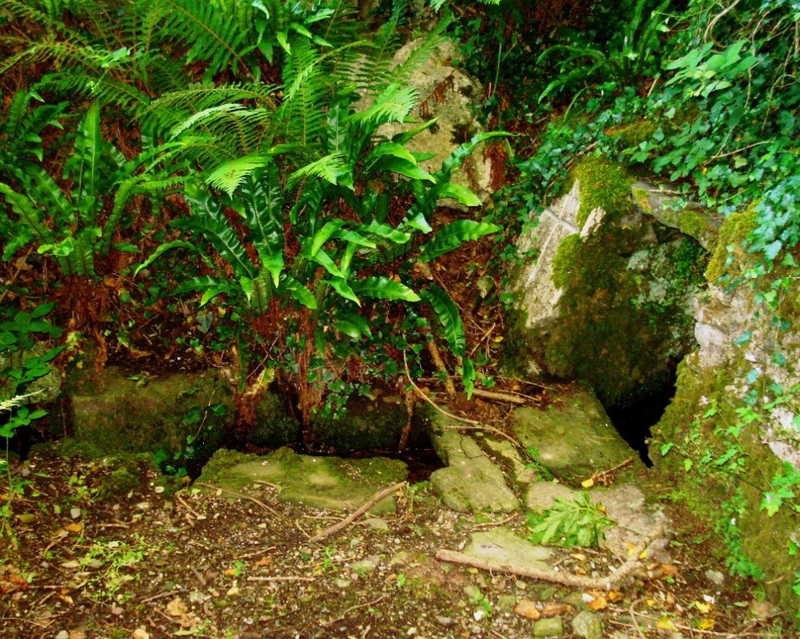 The well, on the right, is set into the hillside and is surrounding by a simple stone structure with a stone drain channel, capped by a slab at the well, running directly out from it. 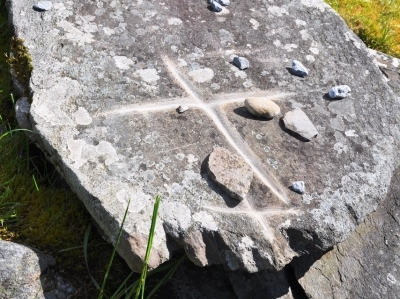 On either side of the well two rocks, which are part of the setting, each have a cross ingrained in them from pilgrims using stones. 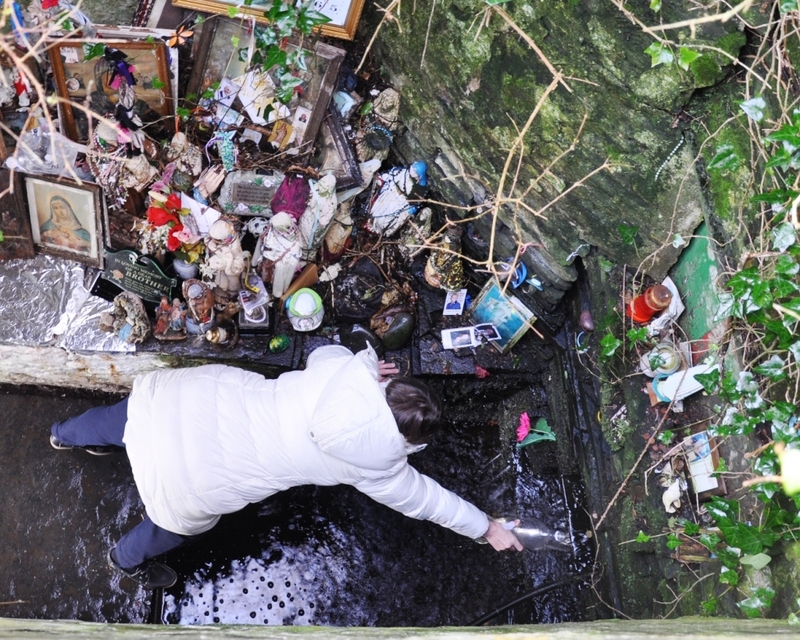 The well, referred to as ‘Sunday Well‘ in maps, is small and pleasant, although it looks like it is rarely used. The archaeological record refers to rounds which were performed their in the past. The site is clean and tidy, but the path down is slightly overgrown and unless you were looking for it, it is unlikely that you would see it. It seems as though it may be visited by a small number of people, presumably locals. The well occupies a space between sites of devotion and activity and ones which have been abandoned. In this, there is a something nice and intimate about visiting the site, although there is the risk that it may fall into disuse and poor repair. 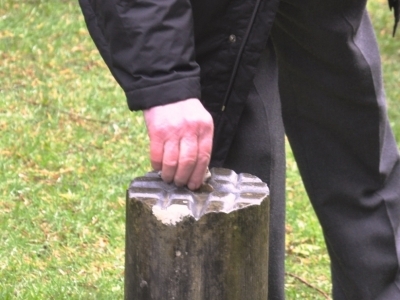 The photo is focused on one of the railings by St Olan’s Well, Aghbullogue, Cork. The well is located next to a bend on the road, on the outside, where a railing, made up of a number of metal posts and two chains running parallel, separates the well-space from the road. 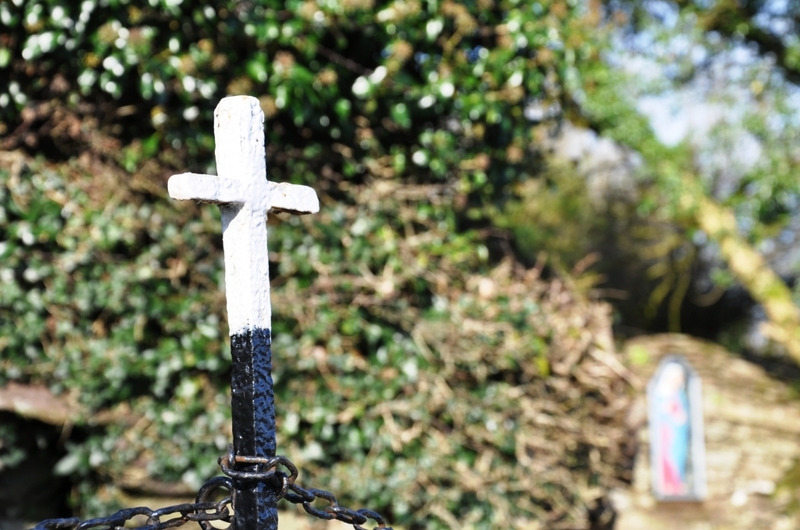 The railings, which are each topped by a cross, and the chains are painted black, and the crosses white – which creates a nice feature. Although, the wearing of the chains as left many of the links with rusty patches. 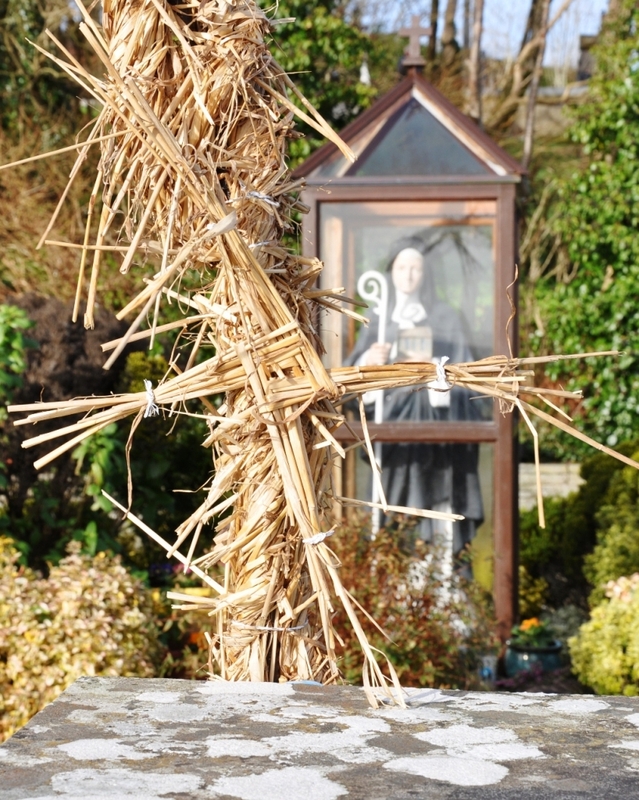 Blurred in the backround is the well’s beehive-structure and the Whitethorn tree that is growing out of it, and, to the right, a statue of Our Lady of the Immaculate Heart. The railings and similar features may not initially seem to be that significant; however, these components all contribute to the place and its character. Places can be considered to be assemblages of different elements, including natural features, representations, practices and objects. 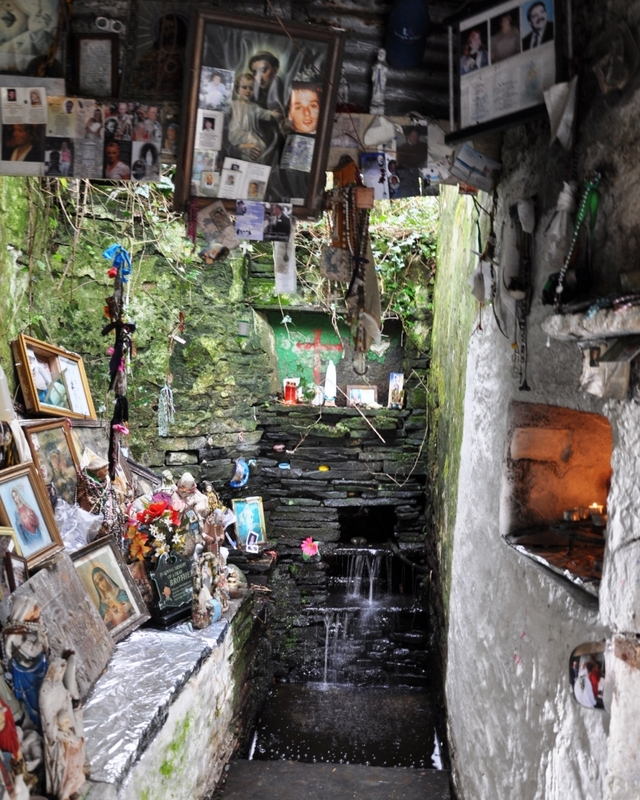 In this context, the St Olan’s well-space is the combined result of the well, the structure, the location, the performances of devotions, the railings and much more. As well as being an aesthetically pleasant focus, this photo literally foregrounds the role of elements such as the railings, which may otherwise be considered incidental.